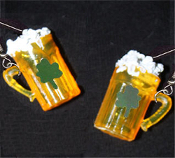 Funky Mini Realistic Foamy BEER MUGS EARRINGS with Irish Shamrock - St Patricks Day Bar Drink Ireland Fun Food Costume Jewelry - Miniature genuine-look, amber-colored Plastic, Dimensional BEER MUG charm, filled with Faux Suds. Approx. 3/4-inch (1.88cm) high x 1/2-inch (1.25cm) diameter. Lucky Shamrocks sequins adorn the front.